The Hogan administration secured a $27.8 million federal grant last month to study the feasibility of a magnetic levitation (MagLev) train between Washington, D.C. and Baltimore. The grant can be used for planning and engineering costs. MagLev trains are propelled through a guideway by powerful magnets. The magnetic force also lifts the train above the surface to reduce friction, allowing smoother, quieter rides and a top-end speed of more than 300 MPH. Gov. Larry Hogan rode a MagLev train in Japan in 2015 and became convinced this technology can help revolutionize travel in the Baltimore-Washington corridor and can serve as the first phase of a high-speed rail to New York and Boston. This isn’t the first attempt to bring MagLev to the Baltimore-Washington Corridor. MagLev originally received funding from the Clinton administration that was gladly accepted by then-Gov. Paris Glendenning. Maryland Democrats seemed to favor the project. Local opposition was initially small, but seemed to take grow when President George W. Bush was in the White House and Gov. Robert Ehrlich was in Government House. Perhaps local politicians from Anne Arundel and Howard Counties really were representing opposition of their constituents, but back then their opposition seemed more partisan than genuine. Things changed when President Barack Obama was in the White House and Gov. Martin O’Malley was in Government House. In 2009, the Obama Administration passed the Recovery Act largely along party lines. President Obama’s team was enamored with high-speed rail, and in 2010, launched the Transportation Initiative Generating Economic Recovery (TIGER) grant program. TIGER grants were designed to jump-start spending on a national high-speed rail system. Amid the rise of the TEA Party, TIGER projects—especially high-speed rail—became symbolic of government waste. When Republican governors from Wisconsin, Ohio, and Florida rejected TIGER funds requested by their Democratic predecessors, the dream of a national high-speed rail system effectively died. While their opposition was criticized as mindless partisanship their rejection of TIGER funds was rooted in practicality. The cost of any future intra-state high-speed rail system would be borne by their respective states, and their constituents had neither the wallet nor the desire to fund such a boondoggle, and there was no real demand for such projects in their states. The enormous cost of high-speed rail is a real concern, with California’s high-speed rail serving as Exhibit A. The project is intended to link Los Angeles to San Francisco, but resistance in the urban corridor, along with the cost of land, makes a direct route politically unfeasible. So the planned route will go East of Los Angeles to Bakersfield, then up through the agricultural heartland. The projected cost for this 500-mile route has ballooned to $68 billion, but that is sure to climb. Ironically, California’s proposed bullet train route through sparsely populated areas in the Central Valley, like Merced, Fresno, and Bakersfield may induce growth by making them short commutes to Silicon Valley and L.A. respectively, defeating the state’s Smart Growth agenda. The Northeast corridor faces a different challenge because it is already developed—there is nothing similar to California’s Central Valley to run a train through. With roads, railroads, and air traffic running near capacity from Washington to Boston, transportation planners are looking for a breakthrough to accommodate growing populations and congestion. Population density and traffic congestion help make the Washington-Boston corridor AMTRAK’s only moneymaking route in the nation. Even so, AMTRAK is slow and expensive. It is cheaper and faster for most people to drive or fly from Washington to Boston than it is to take AMTRAK. The Acela takes six and a half hours, only 90 minutes less than it takes to drive. The Hogan administration says it can complete the 40-mile MagLev for $10-$12 billion, and use public-private partnerships to defray the cost. 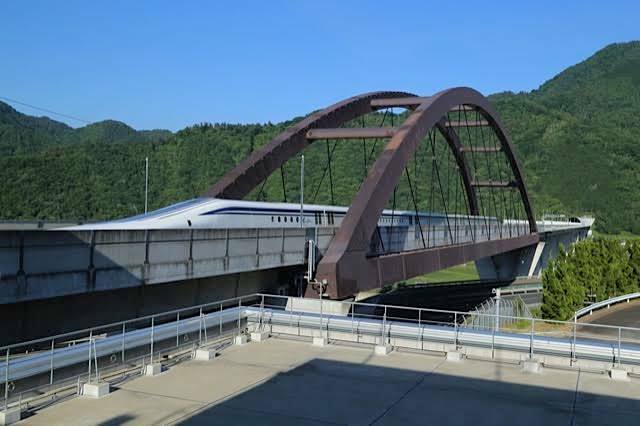 The Japanese government has pledged $5 billion in financing for the project and the railway has said it will not charge licensing fees for the technology, which can make the trip in 15 minutes. By contrast, the hokey-pokey Purple Line light rail will go 16 miles in 45 minutes and cost $5.6 billion. MagLev is a breakthrough technology that can revolutionize regional transportation even as it adds thousands of high-paying construction jobs. Maryland is well positioned to start first leg of the high-speed rail revolution in the Northeast corridor. It’s time for the MagLev to move forward.